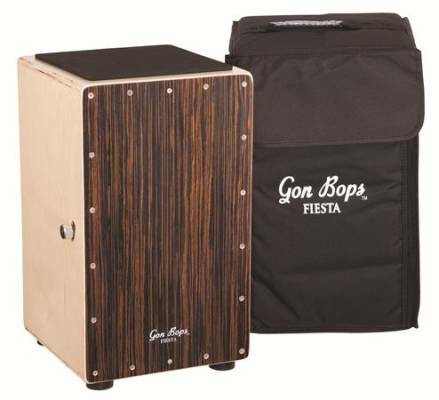 Priced smartly for students, beginners -- or perfect GrabnGo instruments -- Gon Bops introduces new Fiesta Models in 2013, offering more variety in finish and size to the existing line. Both the new Mahogany and Walnut finish Cajons measure 12 x 11.5 x 19.75. Heavy duty rubber feet ensure bass tones dont get lost in the floor, and the Walnut model includes an external knob to adjust the pressure on the internal snare wires, even allowing for the snare to be turned off completely. A free gig bag raises the value factor even further! New to the Cajon since. Great cajon for the price. Awesome features and nice bag included. See James in the Brampton drum department, great guy and knowledgeable.